Sea Transport Solutions’ CEO, Ross Ballantyne, gave a technical presentation on Queensland’s Gold Coast last year describing some of the ship design techniques used when producing optimum vessel type, size, speed and operation method for commercial transport. In his presentation, Mr. Ballantyne stated that the technique is focused on the revenue deadweight of the vessel. Revenue deadweight is the deadweight that vessel operators are being paid to carry, such as cars, trucks and passengers – excluding items such as fuel, water and ballast. Firstly, a review is undertaken of the proposed capabilities of the vessel, including speed, range, operational costs, capital costs and sea-state limitations etc. These capabilities are then deconstructed into revenue units and compared to the lightship weight of the vessel. Comparisons are then made with the vessel’s currently operating within the operating market, including both new and second-hand, which are then plotted on a graph to determine the most suitable vessel for the intended operation. This technique is used across for all STS client who is interested in any form of marine operation and ultimately solves the question “whose vessel is better?” with supporting figures that focus on the optimum solution for the intended operation. When STS is asked to find a better solution than what is existing, the technique used focused on finding the faults of the current vessel and how the operation as whole can be simplified. Ballast is required due to the box-shaped hull and propellers that must be immersed. This results in additional machinery that will need to be maintained. The model testing period of designing a marine vessel plays a critical role right from the very basic design stages. 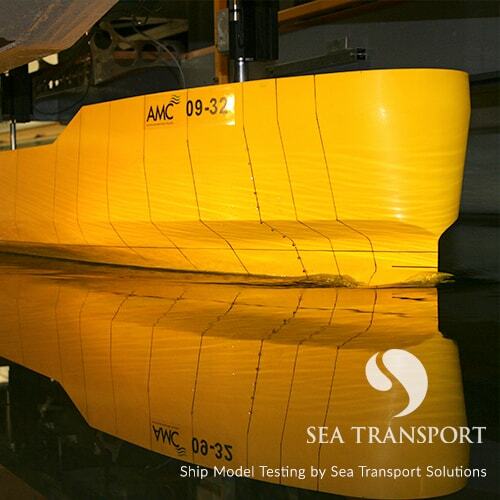 Ship model testing by Sea Transport Solutions began in 1986 with bulbous bow developments on catamarans. Various bulb shapes and sizes were tested including pear, circular and elliptical. Hulls without bulbs were also tested. The most effective bulb improved calm water speed by an impressive 1.5 knots and significantly reduced the motions and accelerations during a sea-state could better maintain head speed in comparison to conventional catamarans and mono-hull vessels. In 1997, STS won an international tender for P&O in India for a 15-metre passenger ferry. 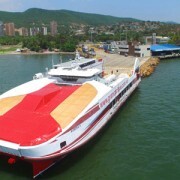 The ferry design required low accelerations at the LCG (the main aspect of sea-sickness, yet frequency dependent) without the use of external appendages for ride control. An efficient hull was required and so tests were undertaken on a 1:3 scale model that proved beneficial. Additional tests conducted were on varying LCB-LCF separations and locations with a 1:10 scale semi-SWATH model located at the Australian Maritime College’s towing tank. These tests quantified both the accelerations and motions as well as the frequency of the heave and pitch RAOs. The results found by STS correlated well with similar research papers. Bulb modifications were made and the testing process was repeated, which resulted in a 23% pitch-motion reduction. Vertical accelerations at the LCG were reduced by 15% and considerably more at the vessel’s wheelhouse. Calm-water resistance was recorded post-modifications revealing that very low resistance was maintained. STS CEO, Mr. Ross Ballantyne, concluded that development and research work should be constant for leading-edge innovations of the Australian marine industry to be sustained into the future. For more information on Sea Transport Solutions’ bankable feasibility studies and vessel design services, contact us today.